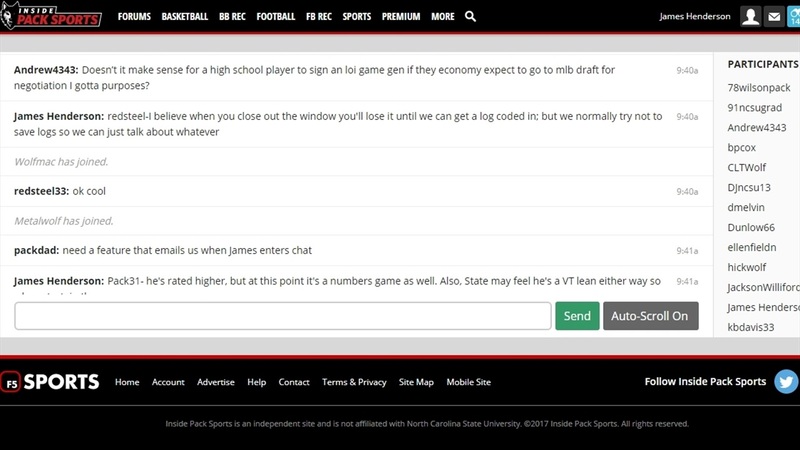 One of the main features we've wanted to provide our subscribers is a functional chat room, and we're thrilled to announce the IPS Chat Room has been tested and is now live! TONIGHT we will be holding a Premium Chat that begins at 8:00PM EST and will last roughly 60-90 minutes. IPS Publisher James Henderson and Football Recruiting Analyst Steve Williams will be in the chat answering questions from subscribers, so make sure you stop by! We will primarily talk about football and football recruiting with Steve, but James will hang around at the end to answer any other questions you want to discuss on Wolfpack basketball and athletics! Remember, there's only one rule of the IPS Chat Room – what is said in chat stays in chat – but we will post a REDACTED recap tomorrow! NOTE: The IPS Chat Room can be accessed two ways.